Essie has released their new summer collection! It consists of six new shades of “soft floral and tart, bright fruits for summer”. our limited edition essie summer 2018 collection will have you making harmony – remember young, wild & me is the only way to be! this summer let’s walk barefoot in a sunny daze and spread the good vibes all daisy long. with everyone making harmony, there is no doubt the fuchsia is bright. it’s the age of empower-mint. so this summer don’t forget, young, wild & me is the only way to be! 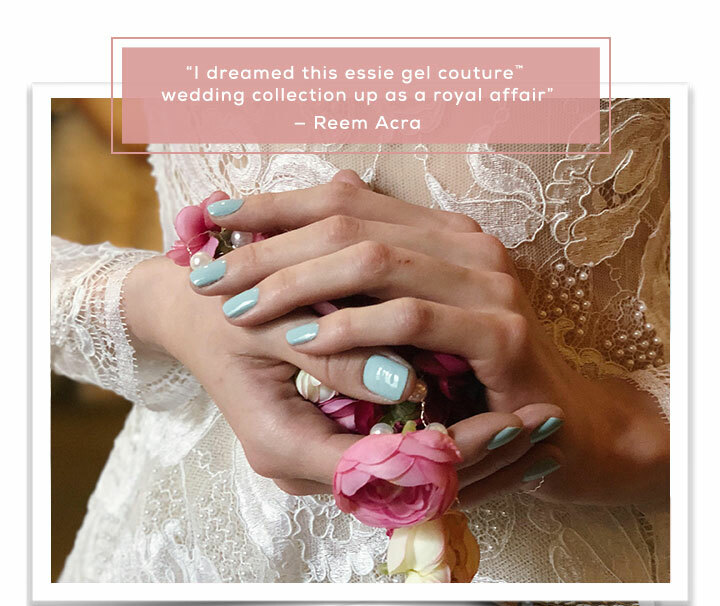 Essie has released their new spring bridal collection in the Gel Couture line, Wedding by Reem Acra. It consists of six new shades of “soft floral and tart, bright fruits for summer”. The collection is a collaboration with fashion designer Reem Acra, whose inspiration for the shades was a royal affair—undoubtedly the upcoming wedding of Prince Harry and Meghan Markle, in particular! enter into the magical wedding world where each shade is crafted to evoke a feeling of love. from getting intricate with the preparation to sharing this special day with your forever familyeverything is perfection. spending precious moments with your handmade of honor before the long awaited moments to mrs. is something you will always cherish. as you indulge in this royal experience your picture perfect wedding will leave you feeling like you’re golden. 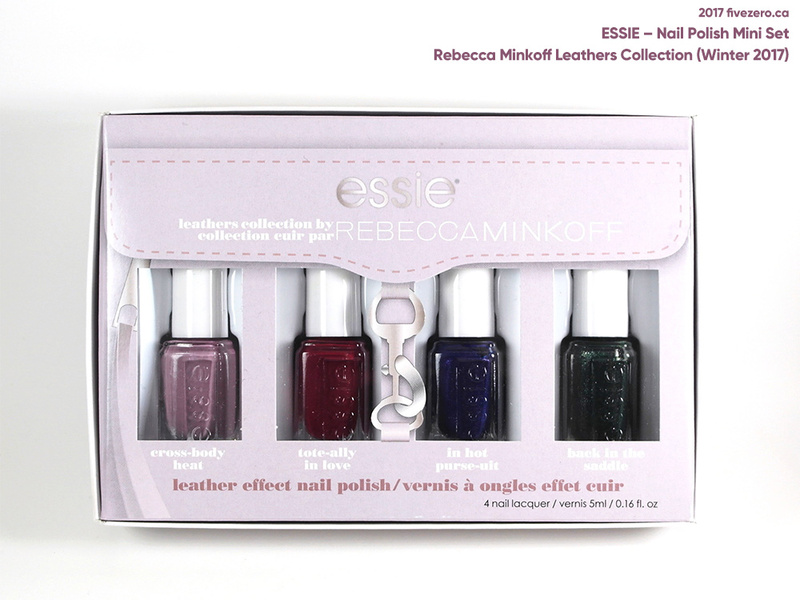 Essie has released three additional new collections this winter: two Gel Couture collections and an expansion to the existing three shades in the Treat Love & Color Strengthener line. I’ve been sitting on several shades of Essie’s Gel Couture nail polish for a while, now—they were launched last spring!—but somehow I never got around to trying them out. When one of my favorite online nail polish stores, Nail Polish Canada, contacted me about reviewing a couple of the Gel Couture colors, I was happy to oblige, and now I feel quite silly for having waited so long to try these. I was sent the Gel Couture Top Coat (which I had actually already owned, haha!) and I chose two shades: Sage You Love Me, from Spring 2017’s Monique Lhuillier Bridal collection, and Twill Seeker, from the original Spring 2016 launch. Today, I am reviewing Sage You Love Me (1044), which I wore all last week with the corresponding top coat. It’s a really lovely, soft and dusty sage green cream—I usually don’t go for sage greens, but this one is nicely balanced and neither too cool nor too warm. I like it a lot on my warm-toned skin, and I think it would work well on a good range of skintones. We had quite a bit of overcast weather last week, so this muted color turned out to be a perfect choice! I also think Essie often do subtle colors amazingly well—so many of their shades seem less than unique in the bottle, but on the nail you can see that they are nuanced and well-balanced.